In March 2002 a combined special operations and conventional forces operation took place in Afghanistan to destroy al-Qaeda and Taliban forces in the Shahi-Kot Valley and Arma Mountains southeast of Zormat. 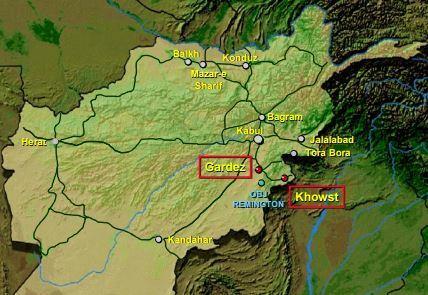 The area was located between the two cities of Gardez and Khowst, Afghanistan. Operation Anaconda: The Battle of Roberts' Ridge, by History Lives On, published on YouTube.com on June 25, 2014. Rescue on Roberts Ridge, by Stone Phillips, Dateline, NBC News, 2006. Grau, Lester W. and Dodge Billingsley, Operation Anaconda: America's First Major Battle in Afghanistan, University Press of Kansa, November 2011. Sean Naylor, Not a Good Day to Die: The Untold Story of Operation Anaconda, available on Amazon.com. Operation Anaconda Overview, Duke University, November 2013. Operation Anaconda in Afghanistan: A Case Study of Adaption in Battle, by Richard Kugler, Case Studies in Defense Transformation Number 5, Department of Defense, 2007. Operation Anaconda, Security Studies Program Seminar, Massachusetts Institute of Techonology (MIT), by Sean Naylor, March 22, 2006. Operation Anaconda Case Study, College of Aerospace Doctrine, Research and Education, Maxwell AFB, Alabama, November 13, 2003. Kraft, Captain Nelson G., "Lessons Learned From a Light Infantry Company During Operation Anaconda", Infantry Magazine, Summer 2002. Soldiers Recount Anatomy of Operation Anaconda, ABC News. September 12, 2012. "Afghanistan War - Operation Anaconda", Armed Forces History Museum. September 9, 2012. "The Battle of Roberts Ridge", Defense Media Network. March 2, 2003. "The Lessons of Anaconda", by Sean Naylor, The New York Times. March 20, 2002. "Afghanistan: U.S., Canadian Troops Reflect on Fighting in Operation Anaconda", Radio Free Europe. March 19, 2002. "U.S. Commander: Anaconda Was a Success", Fox News. MG Frank Hagenbeck said that while Operation Anaconda was over, al-Qaeda and the Taliban would still be actively pursued throughout Afghanistan. General Tommy Franks, CENTCOM commander, called the operation a success despite claims that most of the enemy fighters got away. March 4, 2002. "Operation Anaconda costs 8 U.S. lives", CNN.com.